Bring in Your Vehicle for Professional Car Service. Why Choose Mike’s Tire & Service Center?! A+ Rating from BBB year on year! Do those old worn down tires make a ride in your car not as smooth and efficient as it used to be? Perhaps some new tires will do the trick. Need a minor auto repair, oil change or other car service? With the professional help of our state-of-the-art service center, you can feel rest assured knowing that your vehicle is in the hands of experienced and knowledgeable professionals that care. Welcome to Mike’s Tire and Service Center NC, your premier auto repair and car service shop in Greensboro. It is in our best interest to provide our customers with a most reliable and hassle-free experience while supplying them with the safest and longest lasting services. Whether you need a quick oil change or a major, complex engine repair, we’re a name that you can trust for incredible service! When your vehicle starts making that funny noise again or isn't running smoothly, it can be hard to diagnose the problem on your own. At Mike's Tire and Service Center NC, we work on a wide range of vehicles in our shop. For top of the line car service and care, trust your vehicle to our dedicated mechanics. Bring in your car for an oil change today! Regular oil changes are very important in order to extend the life of your vehicle. Each manufacturer gives different suggestions for how often the oil should be changed and it is advised that you stick to these guidelines. Trying to change your own oil at home is not always as easy as people think. Without the proper tools, an oil change turns into a lengthy process. When it's time for your next oil change, the easiest thing to do is to bring your vehicle in to Mike's Tire and Service Center NC. We perform oil changes almost daily and know exactly how to get them done quickly and professionally. You won't be left waiting around for your vehicle for hours like some service centers. In no time at all, your oil will be changed and you will be on your way once again. Stop fighting to change your oil yourself. Doing it at home can be a hard job. Let the mechanics at Mike's Tire and Service Center NC take care of all of your oil changes in the future. Mike’s Tire and Service Center NC is a full service, auto repair and maintenance NAPA AutoCare Center that has been serving Greensboro, NC and the surrounding locations for over four successful decades. Our specialties include auto repair, oil change, new tires and inspections amongst many other services. We pride ourselves in providing an unparalleled service for our professionalism and dedication to customer satisfaction are unmatched by any other auto repair shop and service center in the area. Engine repairs are one of the most costly and involved types of auto repairs around. If your vehicle is faced with engine issues, you should only trust the repair to an experienced and professional mechanic. At Mike's Tire and Service Center NC, our mechanics are highly skilled in many different complex engine repairs and more. When choosing a service center, reputation is everything. You should never take your vehicle to a shop that isn't reliable. Mike's Tire and Service Center NC has worked hard to build a lasting and trustworthy relationship with the Greensboro, NC community. For all car service maintenance and auto repairs, bring your vehicle in to their mechanics. You will receive your diagnosis quickly, and then they will begin work on your vehicle. 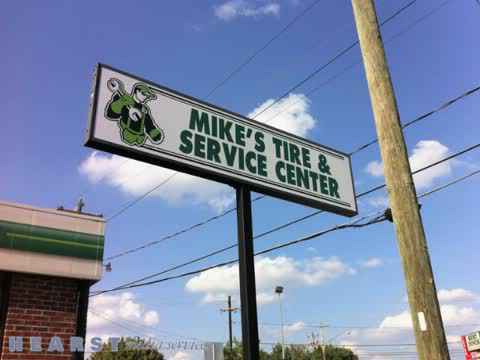 If you're from the Greensboro, NC region, you've probably heard of Mikes Tire and Service Center NC. We are a great auto service center that can work on all types of vehicles. Domestic and imports are no trouble for us. Just bring it in to our service center and one of our highly qualified mechanics can take a look for you. All of our car service repairs are affordable. For more information please feel free to visit our website. There you will find a full list of our services and a convenient, easy-to-use service request form. We are located in Greensboro, NC and serve a wide range of areas including High Point, Oak Ridge, Summerfield, Stokesdale, Winston Salem, Archdale, McLeansville and Kernersville. Our service shop is open Monday through Friday from 7:30 AM to 5:30 PM and Saturdays from 8 AM to 1 PM. Need an auto repair or engine repair? Looking for a set of industry leading new tires or a quick oil change? Fill out our online service request form or give us a call at (336) 365-0857 today! You will find that we run a friendly, clean and efficient auto repair and maintenance service center. To help accommodate your auto repair needs, we offer early bird and night-owl drop-box service and local shuttle service to your home or office; we’re here to take the hassle out of pesky car problems that can interfere with your day-to-day routine. At Mike’s Tire & Service Center NC, we know how busy you are and want to help keep your vehicle in top condition. We also supply our customers with friendly service reminders—when it’s time for maintenance, we’ll keep you informed. We are Mike’s Tire and Service Center NC, your first choice for car services, auto repair, new tires, engine repair and more in Greensboro and the surrounding areas. Call today to schedule your car service! Thank you for visiting our site, we look forward to seeing you soon! Continental, Michelin, Nexen, Hankook, Kumho, Pirelli, Firestone, Yokohama, Cooper, Bf Goodrich, Bridgestone, Uniroyal, Oil Changes, Tune Ups, Engine Repair, Engine Replacement, Engine Performance Check, Computer Diagnostics, Air Conditioning Service & Repair, Electrical System Diagnosis & Repair, Brake Repair, Factory Scheduled Maintenance 30k, 60k, 90k, Suspension And Steering Repair, Shocks & Struts, Cooling System Service & Repair, Mufflers, Transmission Service & Repair, New And Rebuilt Transmissions, Tires: Mounting Balancing And Flat Repair, Wheel Alignment, Pre-Purchase Inspections, Maintenance Inspections, Brake & Lamp Inspections.